For the Interstate 84 in Oregon, Idaho, and Utah, see Interstate 84 (Oregon–Utah). Interstate 84 (I-84) is an Interstate Highway in the northeastern United States that extends from Dunmore, Pennsylvania, (near Scranton) at an interchange with I-81 east to Sturbridge, Massachusetts, at an interchange with the Massachusetts Turnpike (I-90). 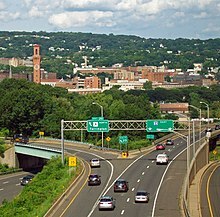 Among the major cities that the road passes through is Hartford, Connecticut. Another highway named I-84 is located in the northwestern United States. Interstate 84 starts in Pennsylvania at Interstate 81 in Dunmore, Pennsylvania, a suburb east of Scranton. After two miles (3 km), I-84 interchanges with Interstate 380, with I-380 going southeast through the Poconos and I-84 continuing almost due east into Wayne and Pike counties. Pennsylvania began replacing sequential exit numbers with mile-based numbers in 2001. This section of Pennsylvania is very lightly populated, and there are no major settlements on or near I-84, although it offers access to popular outdoor recreation areas such as Lake Wallenpaupack and Promised Land State Park. Its right-of-way is very wide, with a large median strip between the two roadways as it passes through densely wooded country, except for the swampy areas in southern Wayne County. The only development along Pennsylvania's section of I-84 is where US 6 and 209 start to parallel closely and form a commercial strip just south of Matamoras, just west of the Delaware River. I-84 reaches its highest elevation in Pennsylvania and in the east just west of exit 8 at 1800 feet. I-84 enters New York by crossing both the Delaware and Neversink rivers on a long bridge south of Port Jervis, the first large settlement near the highway. South of the road, at the confluence of the Delaware and Neversink rivers, is Tri-State Rock, where New Jersey, New York and Pennsylvania converge. The first mile of the road in New York runs along the New Jersey state line, then curves to the north to climb the Shawangunks and cross Orange County, where it forms one leg of a distribution "golden triangle" with NY 17 (future I-86) and the New York State Thruway (I-87). I-84 includes the Newburgh–Beacon Bridge across the Hudson River at Newburgh. East of the bridge and the city of Beacon, I-84 continues to head east across Dutchess County, beginning to turn south in the mountainous areas east of the Taconic State Parkway and into Putnam County. At Brewster, where Interstate 684 heads south towards New York City, the road resumes its eastern course into Connecticut, closely paralleled by US 6 and 202. The interstate's first exit is at the state line, where it enters the city of Danbury. Here it is designated the Yankee Expressway. Two miles to the east, where US 7 comes in from the south near Danbury Fair Mall to join I-84, it turns to the north. At the next exit, routes 6 and 202 join the highway. The four-way concurrency ends after 3 miles (4.8 km), when 7 and 202 split off north towards New Milford. Route 6 leaves the interstate at the next exit, and I-84 continues east across the countryside. At Exit 11, it turns to the northeast and descends to cross the Housatonic River on the Rochambeau Bridge, into New Haven County. It then climbs onto higher ground to the city of Waterbury, which it passes on an elevated viaduct with the eastbound and westbound lanes on different levels. Here the CT 8 expressway intersects. The eastern heading continues past Waterbury to Milldale, where Interstate 691 splits off to the east. This section has many left-hand exits and entrances and sharp curves, which were built for a planned network of freeways. I-84 heads northeast towards New Britain and Hartford, the state capital and the largest community along its eastern length. After intersecting Interstate 91, the road crosses the Connecticut River on the Bulkeley Bridge, oldest on the Interstate system, then becomes the Wilbur Cross Highway and continues towards the northeast. The last exit in Connecticut is Exit 74, an exit for Route 171. I-84 crosses the Massachusetts border in the town of Union. The Wilbur Cross Highway continues on Interstate 84 after the highway crosses the state line. For a short distance (approximately 90 yards eastbound and 200 yards westbound), the interstate passes through the town of Holland in Hampden County before crossing into Sturbridge in Worcester County for the remainder of its length. I-84 has only three exits in Massachusetts, before ending at Interstate 90, the Massachusetts Turnpike. I-84 ends at Exit 9 of I-90, which is located in Sturbridge, 7.7 miles (12.4 km) into the state, making the Massachusetts section of the highway the shortest distance within any of the four states it traverses. Interstate 84 was originally to head east from Hartford, Connecticut to Providence, Rhode Island. The original route of Interstate 84 would have used present-day Interstate 384 to Bolton, Connecticut, then along a never-built section of freeway that would have connected to the US 6 bypass around Willimantic, Connecticut. Another never-built freeway section would have connected it to Interstate 395 and extended I-84 onto State Road 695 in Connecticut, the easternmost portion of the Connecticut Turnpike in Plainfield, Connecticut. From there, it would have roughly followed US 6 through western Rhode Island to connect to the present-day US 6 freeway in Johnston. From there, a freeway from Olneyville Square to the Interstate 95–Interstate 195 interchange was briefly considered, but abandoned in favor of what later became the Route 6-10 Connector. Sections of I-84 in Connecticut were reconstructed and widened in the 1980s. The former I-86 portion from East Hartford to the Massachusetts state line was completely rebuilt from a narrow 4-lane freeway to a much wider profile ranging from 6 lanes at the Massachusetts state line, expanding to 8 lanes in Vernon, to 12 lanes with HOV lanes in East Hartford. Another section through Danbury was widened from 4 lanes to 6 lanes in 1985 and 1986. Widening of the highway through Danbury was funded by Union Carbide as part of building its world headquarters in Danbury. Though the route was confirmed in Connecticut, many issues remained in Rhode Island, the biggest of which were major environmental concerns about how the freeway would affect the Scituate Reservoir, which is the main drinking water supply for Providence. In an attempt to ease environmental concerns, an alternate route was briefly studied in Rhode Island that would have connected Interstate 84 to the present-day Route 37 freeway. This would have allowed construction of I-84 south of the Scituate Reservoir. Major community opposition caused this plan, as well as all plans for a Hartford-Providence expressway, to be scrapped in the 1980s. In the 1992 long-range transportation plan released by the Rhode Island Department of Transportation, a freeway was added along the original route of Interstate 84 that will connect to the CT 695 freeway on the Rhode Island–Connecticut border. The section of I-84 between East Hartford, Connecticut (at the present-day junction with Interstate 384) and Sturbridge, Massachusetts (Interstate 90) was for a time signed as Interstate 86 (unrelated to present-day Interstate 86 in New York and Pennsylvania). Signs stating "I-84 Ends, I-86 to Boston" (eastbound) and "I-86 Ends, I-84 to Hartford" (westbound) were posted where the change took place. Exit numbering on I-86 was that of the road's predecessor, Route 15, in a sequence beginning on New York's Hutchinson River Parkway. Exits were renumbered to correspond with the rest of I-84 in Connecticut when the road was redesignated in 1984. The present I-384 as well as the present US 6 bypass near Willimantic, both of which were a part of what was then I-84's planned easterly continuation, were also numbered I-84 prior to 1984 even though they lacked any direct connection to the rest of I-84 at that time. (Drivers had to use Silver Lane in East Hartford to travel between the two stretches of the highway.) These two sections were re-numbered I-384 and US 6 when what was then I-86 was re-numbered I-84. As I-84 was built with federal funds, there are generally no highway tolls. 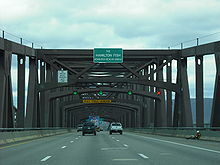 The exception is I-84's Hudson River crossing, the Newburgh-Beacon Bridge. Since the bridge is under the New York State Bridge Authority, it carries an eastbound-only toll of $1.50 for passenger vehicles. From 1992 through 2006, Interstate 84 in New York was a toll-free component of the New York State Thruway system. It was transferred by the state DOT to the Thruway Authority in order to capitalize on that agency's steady revenue stream from upstate sources. In 1992, maintenance responsibility for I-84 in New York was transferred to the New York State Thruway Authority and the monies for that purpose came from existing tolls on I-190 in downtown Buffalo, more than 300 miles (480 km) away. On October 30, 2006, the Thruway Authority began the process of returning maintenance and operation responsibilities to NYSDOT and the tolls in Buffalo were discontinued. The I-190 tolls were considered to be one of the principal causes of highway congestion in Buffalo. From 2006 to 2010, maintenance was performed by the Thruway Authority with funding provided by the state legislature. On October 11, 2010, NYSDOT resumed full control of I-84. A widening project along the congested stretch of I-84 through Waterbury and Cheshire, Connecticut was beset by cost overruns, delays, and construction defects involving storm drains, as state and federal officials have launched criminal investigations stemming from this project. This episode diminished local enthusiasm for a proposed $2 billion reconstruction of the "Mixmaster" interchange in downtown Waterbury between Route 8 and I-84. Cost estimates for the Mixmaster replacement have increased to $3 billion. Former Connecticut Attorney General Richard Blumenthal began a lawsuit against the contractor and an engineering firm in response to threats from the U.S. DOT to withhold funds from the project. On May 18, 2007, the Waterbury Republican-American reported this area had defective light poles, while Governor M. Jodi Rell released an audit report of the construction disaster. A number of DOT personnel were either fired or reprimanded following the scandal. Additionally,[when?] the FBI and a federal grand jury investigated the now-defunct construction company and the same DOT officials, although none of these investigations have yet to result in criminal charges. I-84 has two current and two former auxiliary routes. I-384 is a spur of I-84 in Manchester, Connecticut. I-684 connects I-84 in Brewster, New York with I-287 in Harrison, New York. I-284 was a planned but never built expressway relocation of US 5 to bypass East Hartford, Connecticut along the eastern shore of the Connecticut River. I-484 was slated to be built south of downtown Hartford, Connecticut (connecting with I-91), but that highway was never completed. ^ a b c d e f Federal Highway Administration (October 31, 2002). "Table 1: Main Routes of the Dwight D. Eisenhower National System of Interstate and Defense Highways as of October 31, 2002". Route Log and Finder List. Federal Highway Administration. Retrieved July 20, 2011. ^ "Elevation Finder". Freemaptools.com. Retrieved January 29, 2013. ^ "Do You Remember?". The News-Times. Danbury, CT. September 4, 2005. Retrieved October 4, 2014. ^ "Toll Schedule/EZ-pass Info". New York State Bridge Authority. Archived from the original on April 24, 2015. Retrieved April 29, 2015. ^ "New York State Department of Transportation to Maintain Interstate 84 Beginning October 11" (Press release). New York State Department of Transportation. October 8, 2010. Retrieved October 4, 2014. ^ "I-84 Job Plagued by Defective Drainage System". Construction Equipment Guide. October 18, 2006. Retrieved January 29, 2013. ^ "Interchange Construction Planned: For 2021". Hartford, CT: WFSB. September 25, 2006. Archived from the original on June 19, 2007. ^ "United Technologies To Sponsor Sunken Garden Festival In Farmington". Hartford Courant. April 24, 2012. Archived from the original on January 21, 2013. Retrieved January 29, 2013. ^ Office of the Governor. "Governor Rell: I-84 Consultant Releases Final Audit Report". State of Connecticut. Retrieved January 29, 2013. Wikimedia Commons has media related to Interstate 84 (Pennsylvania–Massachusetts). This page was last edited on 1 April 2019, at 17:59 (UTC).